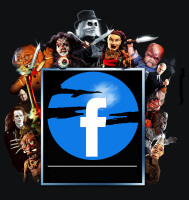 Many diehard fans know the movies of PuppetMaster and claim they know almost everything there is to know about the series. Surprisingly, what most fans do not know is that there is a comic book miniseries. What is also interesting is that the comic book series was created before PuppetMaster 2 and 3. 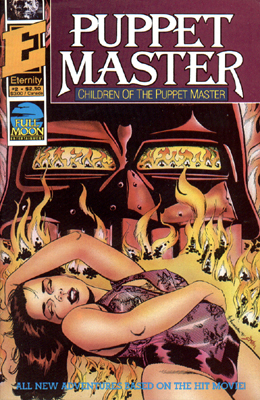 The storyline is slightly different; however, my point of view is that PuppetMaster 2 and 3 is based on this comic book series. Created by Eternity Comics along with Full Moon Entertainment. The first book explains the murder of Elsa and how Dr. Toulon was able to transfer her soul into a doll representing her likeness (Leech Woman). A really cool part in this particular issue is that you see the puppets interact as people do, for example, there is a part where Leech Woman saves Blade from getting runned over by a car, and Blade replies with a sigh of relief and indirectly thanks her. The beginning is the exact same as the first PuppetMaster film, where you see Toulon kill himself. The second issue picks up right where the first one left us. We are introduced to Paul Toulon, Andre’s cousin, who manages Zarabodega Bay Inn. This lightly gives the story more merit because it explains the reason why Toulon escaped to America in the first place. In this issue, Paul orders a maid to clean the room where Andre was killed. Later on in the night, two German spies sneak into the room and begin looking into Andre’s trunk. When the trunk is opened, Blade and Pinhead attack the spies, startling them. Thinking the room is boobie trapped (not realizing the puppets are actually alive), the maid suddenly enters and out of instinct, one of the spies shoots her, killing her. Later, we see an actor named Chuck Dalton and his lady friend have rented Andre’s room, then, a German couple tries to check into the exact same room, but find out it’s been taken. Coincidently, the room down the hall from Andre’s room is available, and they take it. The couple attempts to be friendly to Dalton, even seducing him, and once he is out of the picture, begin looking through the room. The puppets do what they do best, kill them off. Paul goes to the room to investigate the commotion only to come across bodies and the puppets who have Andre’s diary. We then end on a more familiar note, the opening scene to PuppetMaster 2. We begin this issue with Andre being resurrected by his puppets, which surprises Paul. We’re then shown a couple of (new) disgruntled Germans, Kron and Capt. Loemann, trying to discern the events that happened at the inn. They decide to go to Cairo, Egypt since it was the place Toulon got the formula in the first place. The Germans, not knowing where to even begin, receive help from a one eyed man who happens to be mute, however, he is able to see Anubus, the resting tomb of a pharaoh, which lies the secrets to reanimation. Little do the Germans know throughout the trip that the puppets are following them. It is unclear how they got through customs, airport security, etc. As they search through the desert for the tomb, they have no luck, so they make camp. On the trip, there’s three Germans; a soldier, a general and a doctor. The doctor is killed while making camp. The general and the soldier make it to the tomb of Anubis. This turns out to be a trap, as the soldier is killed. All that is found in the tomb is the story along with secrets the only thing that is left is Andre’s formula. The last scene shows the Germans explaining that the formula may be long gone, but quickly realize the secret could be found deep in the puppets. This issue begins back at the hotel run by Paul Toulon. A reporter by the name of Maxwell is investigating the deaths that happened earlier (in book 2), and of Chuck Dalton. An argument erupts between Paul and Maxwell as to why people keep disappearing at the hotel. We then see on the Ferry Building Torch, who calls a conference with Andre and explains how many more people have to die before this ends. He feels Andre’s pain but doesn't see why so many people have to die. Andre tells him “…the Germans were a necessary kill”. A confrontation erupts between Paul and Andre, and Maxwell overhears and discovers Andre building a new puppet. He also witnesses the other puppets movements and sees they’re not control by strings. Maxwell rushes to call his editor to tell them the scoop, but then is quickly murdered. They believe Blade murdered the reporter, who is later discovered to have been a German. The final confrontation happens at the Bell Tower where the Germans and Andre have a standoff between the puppets. The Germans admit to opening Elsa’s grave and unearthing Andre’s diaries, however, they were still missing one piece of the puzzle, the formula. The Germans shoot Leech Woman and notices she’s bleeding. This infuriates Andre and he lunges himself at the Germans, falling out of the window to a rocky grave. Shockingly, Andre survives, and gives the last of the formula to Leech Woman. He realizes then that living is not worth the fight. We end with Paul and the puppets burying Andre. Interestingly, Book 5 is based exactly off of the first PuppetMaster film from beginning to end. It just doesn’t elaborate on character details.